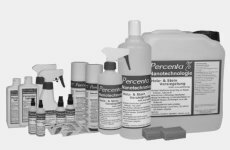 'Percenta Nano Textile & Leather Sealant' is a water and oil resistant impregnator for textiles and paper. The product develops an almost invisible film on the surface around the fibres. Through the water resisting effect, the absorbance of water and stains of; for example, soot or coffee, will be reduced. 'Percenta Nano Textile & Leather Sealant' is dry cleaning resistant. Our 'Nano Textile & Leather Sealant' surrounds every fibre with an anti adhesion coating. As a result, dry dirt cannot adhere to the material and liquid cannot be soaked up by the fibres. Water, coffee and fatty substances are repelled from the treated textiles. Even excessive soiling can be removed easily and without a trace. Leather, backpacks, marquees, sunshades etc are cleaned in the rain. Furthermore, 'Percenta Nano Leather & Textile' coated fibres are completely harmless to skin. The product is free from alcohols, water based and environmentally friendly. 'Percenta Nano Leather & Textile' is the ideal dirt resistant and invisible sealant for clothes made of wool, silk, synthetics and leather. The look, texture and breathability of the material remains. 'Percenta Nano Leather & Textile' can be applied on every textile - from finest silk to hard wearing cotton - on suits, jackets, shirts, blouses, sports jackets, ties, trousers, track suits, jeans, rain coats, motorcycle clothing, anoraks, leather garments and even adventure wear. 'Percenta Nano Leather & Textile' is also water resistant on materials in daily use, which as a result remain drier for longer. Oil, coffee and other stains belong to the past after a treatment with 'Percenta Nanotechnology Textile & Leather'. This innovative fibre protection, based on nanotechnology, protects your clothes against water, dirt and stains - and stays invisible! It does not affect the look, texture, breathability or colour and it's easy to use. Ironing also does not affect our 'Percenta Nano Leather & Textile'. Prevents tea, coffee and ketchup stains etc. Shoes need to be looked after as they are punished the most. Especially when they get wet, dampness can get through the shoe to the socks, which is not comfortable and can cause a cold. This can be prevented with our nano sealant. Oiled shoes should not be treated with our sealant. For hiking clothes and jackets a sealant is very useful. After a treatment with our sealant, rain cannot get through the surface, but the clothes remain breathable, the skin can breath and you don't get wet, which can prevent a cold. Through dampness, moss adheres on marquees, sunshades and convertible car roofs. Especially marquees and sunshades, which are not put away after use, can get wet in rain leading to stains and mould forming. For prevention use our 'Nano Textile & Leather Sealant'. Some uniforms are exposed to the weather, for example police uniforms. With our textile sealant, rain is simply repelled and cannot get through to the fibres. For winter sports, sealing textiles is of great advantage. Such clothing has to stand a lot of extreme conditions. The upper layer often gets wet, which affects the breathability. With our 'Nano Textile & Leather Sealant' water is repelled and as a result cannot get through the upper layer. Spilt soup or coffee can be annoying, as it is not always possible to clean immediately, leading to staining. Our sealant is a great prevention. Soup, fat etc cannot get through to the fibres anymore and can simply be shook off the clothes. Also suitable for silk. Car seats of every material can be treated with our sealant. Through sitting on the seats with wet/dirty clothes, limescale and other contaminants develop on the seats. Seats treated with our sealant protects the fibres. As a result dirt cannot get through the surface into the fibres.